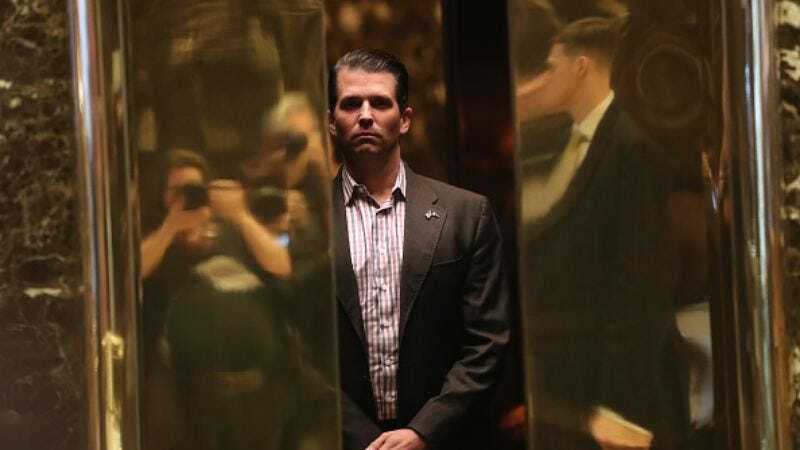 Now that the eighth Musketeer has been flushed out, we’re trying to figure out just what the ramifications of Donald Trump Jr.’s meeting with a Kremlin-linked lawyer during the 2016 presidential election will be. Special counsel Robert Mueller is investigating everyone involved in the meeting, including Trump’s former campaign manager Paul Manafort and current son-in-law Jared Kushner, for possible collusion. And now that it’s been confirmed Trump Jr. was looking to get damaging info on Hillary Clinton at that meeting, some Democrats are calling for Kushner’s security clearance to be revoked, which could hinder him in running the country. We’ve yet to see how any of those efforts will turn out, but there has been one immediate repercussion—Trump Jr.’s on a self-imposed timeout, which means he can’t play with any of his business friends. The younger Donald, who’s now executive director of the Trump Organization, still has to go into work every day, like a sucker. But he’s said to be “miserable” over not being able to do deals, because, in light of what could be some light treason, they’ll be “overly scrutinized.” Like that time he claimed he met with a Russian lawyer to talk about adoptions, but it turned into something more clandestine, only he said it totally wasn’t when it kind of was. Those kinds of wheelings and dealings are a no-go right now, leaving Trump Jr.’s agenda wide open to hear pitches from Eric Trump about a restaurant where you make your own pizza. Of course, that circumspection—or just a modicum of decency—would have come in handy back in June 2016, but this administration’s never been one to look back. Well, except for when Trump wonders why the Secret Service didn’t stop his son from being an idiot.